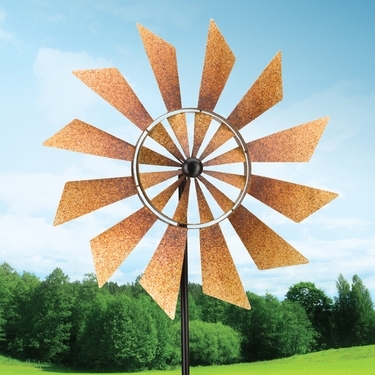 Unlike any of our other kinetic stakes, our 32” Rustic Turbine Wind Spinner features a spinning blade nested within the center of another windmill style blade - the blades spin in opposite directions creating a captivating effect! Hand-painted with a rust colored patina finish and powder coated to resist the elements. This new kinetic stake will blow you away! Rust patina finish, powder coated for durability.